Isle Surf & SUP has become one of the most well-known and trusted brands of SUP boards in the world. The company has been making top-rated boards for years and many of their boards are top sellers on the SUP market. 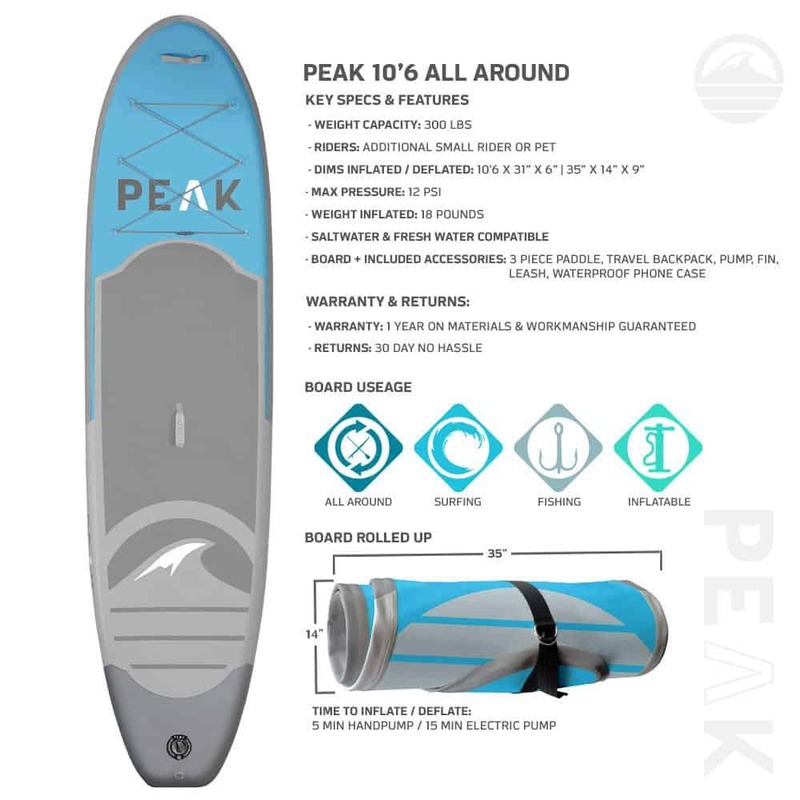 In fact, the Peak “Expedition” and “10’6” Inflatable models are among the top inflatable paddleboards available anywhere. Isle Surf & SUP has a solid reputation and are respected industry wide for their quality and durability. All the company’s paddleboards are made from top-quality materials, ensuring you years of worry-free service, and come with many accessories you would typically have to purchase separately with other manufacture’s boards. Measuring six-inches thick, it is not easily submerged or prone to folding while you are on it. At 31-inches wide, the board is just the right width to provide enough space and stability while compromising neither speed nor agility. With its 10’6” length, this board is also easy for the beginner to handle. Whereas traditional paddleboards are prone to scrapes, dents and dings, its military-grade PVC construction makes it tough enough to stand up to obstacles that would take a heavy toll on most SUPs. The board’s diamond-traction deck pad is as efficient at preventing you from slipping as it is at providing your feet all-day comfort. 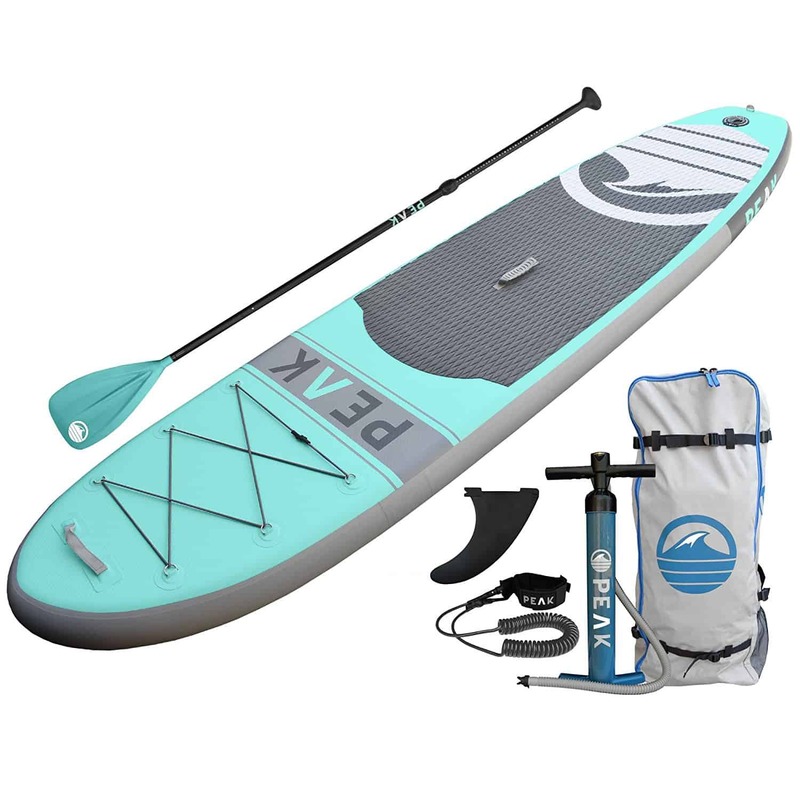 The board comes in white, blue and aqua and the package includes a paddle, coil leash, a high-pressure air pump and a carry backpack. Versatile, all-around design suitable for all skill levels and conditions. Ample bungee-storage system for gear. Removable fin for easy transportation. 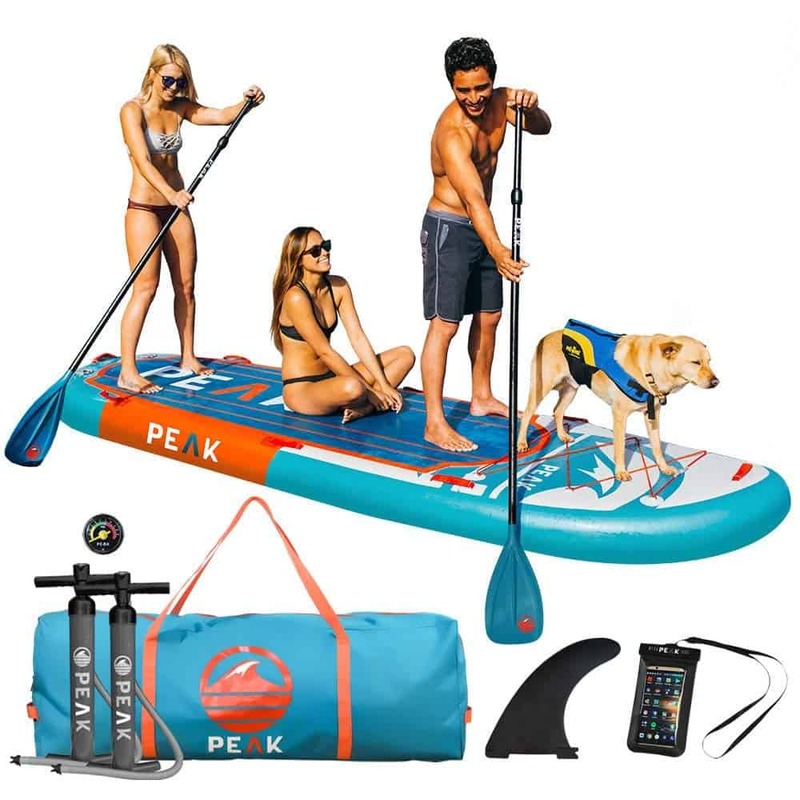 A paddle, leash, air pump and carrying bag are included. Large fin for better tracking. The paddle is a little on the heavy side and could be an issue for smaller paddlers. Not really suited for racing. Many paddlers assert there is not a better beginner or recreational inflatable on the market and that the manufacturer delivers everything it promises. While inflating the 10’6” with the supplied air pump requires a little effort, it doesn’t take much time. The Isle inflatable is lightweight, easy to carry and is very stiff when fully inflated. The board tracks well and the traction pad is soft and comfortable. 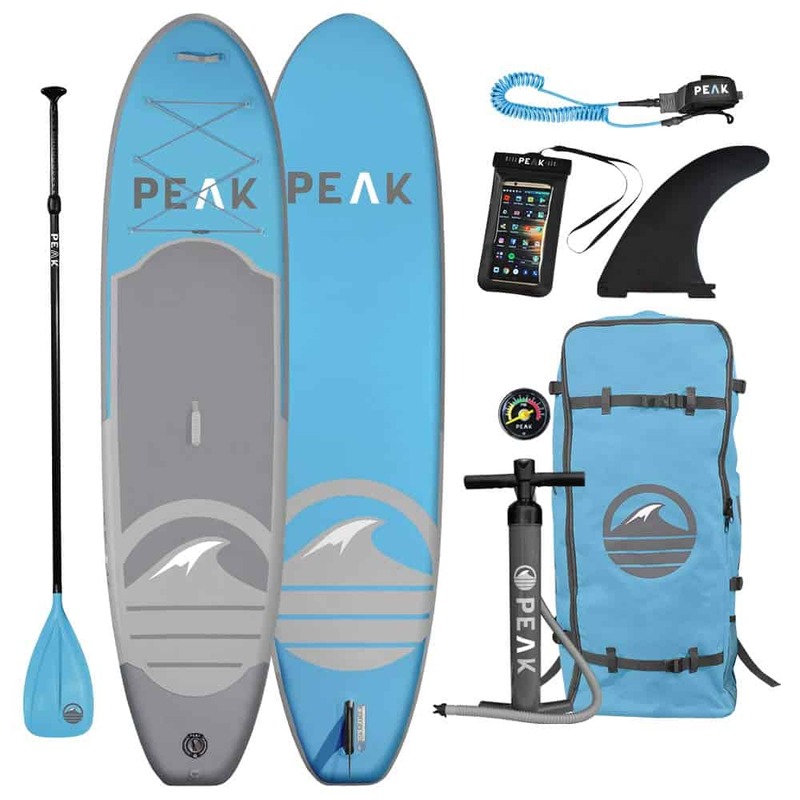 The Peak Escape Soft Top Aqua SUP Board is designed for style, comfort and function. Sporting a beautiful aqua color, the accessories also come in coordinating colors so you can look great when hitting the water. A true hard board, the soft-top construction promises your feet will be comfortable throughout your day. The Escape is easy to maneuver and offers ample deck space with a large bungee storage system. The high-tech materials used in constructing this board makes it ultra-strong without excessive bulk or weight. Unlike typical hardboards that easily get scratched, the Escape can stand up to hard use. Standard accessories include a two-piece paddle, center fin, a waterproof phone case and a leash. Large six-point bungee storage system. Suitable for a wide array of conditions. Measures: 10’5” x 32” x 4.5”. Soft top provides for comfortable and secure footing. Harder to store and transport than inflatable models. Users feel this board is attractive, lightweight and definitely comfortable to ride. The soft top receives high marks as it provides for secure footing, but doesn’t compromise the quality of the board. This board paddles smoothly and tracks well in the water. 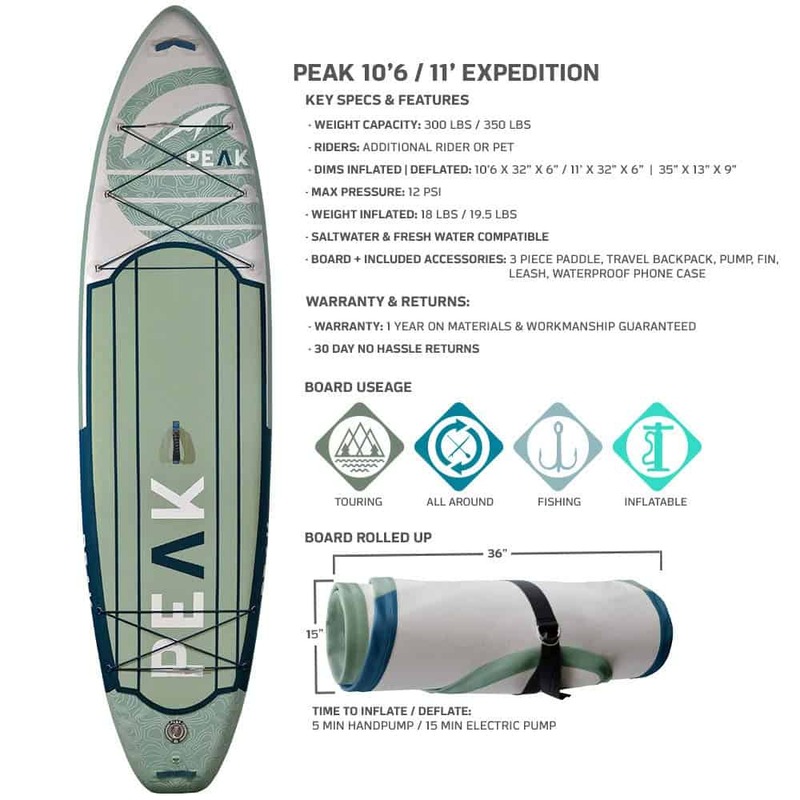 The Isle Peak Expedition inflatable may be the perfect board for paddlers wanting to take long trips. Everything about the Expedition is designed to make your adventures on the oceans, lakes and rivers enjoyable, memorable and hassle free. The Expedition’s lightweight construction makes it 35 percent lighter that other SUPs in its class. Weighing in at only 19.5 pounds, you can carry the Expedition to your most favorite remote spots and paddle as long as you like. The Expedition’s deck has a soft-traction pad that is both child and pet friendly and is equipped with a very large bungee-style storage system on both the forward and aft sections of the board. Like it’s brother (The Airtech Explorer) the Expedition’s construction is extremely tough, so you can forget about scratches, dents and dings with the Expedition. 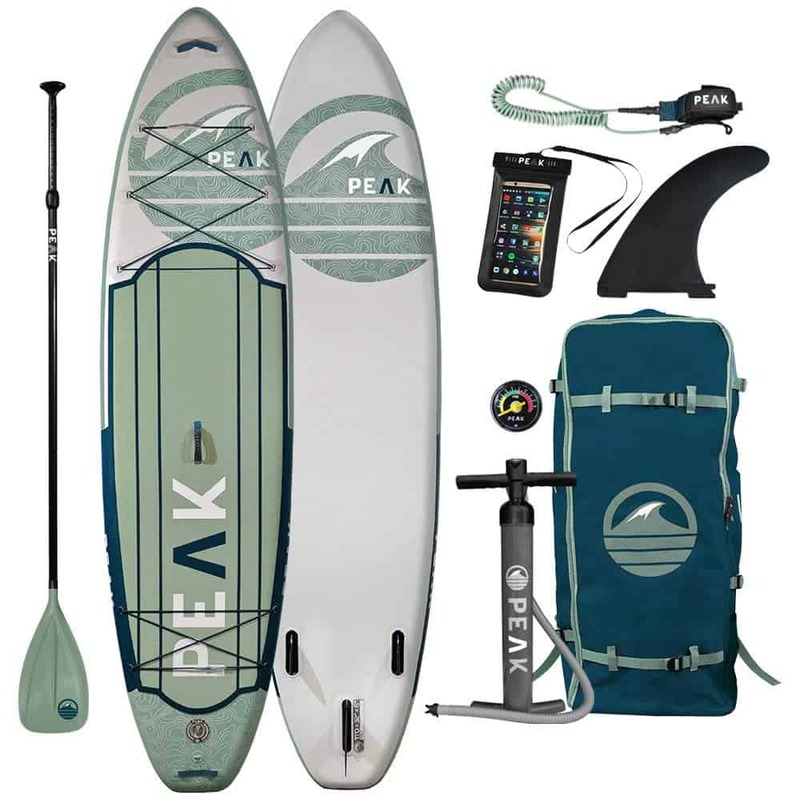 The expedition is available in aqua and moss colors and the all-inclusive color-matched accessory package includes a floating paddle with nylon blade, coil leash, high-pressure air pump, snap-in center fin, waterproof phone case and a carry backpack. Comfort deck pad for secure footing. Large deck space and storage system. Measures: 11’ x 32” x 6”. Maximum weight capacity of 350 pounds. Not the best choice for beginners, as the board requires some experience to control. Because of its size, the board is extremely stable and a good choice for beginners, but inflation does require a bit of work. The lightweight paddle is easy to control and the two-part storage system can handle anything you may want to bring along. Most paddlers report the board is more that they expected and would not hesitate to recommend the Expedition. 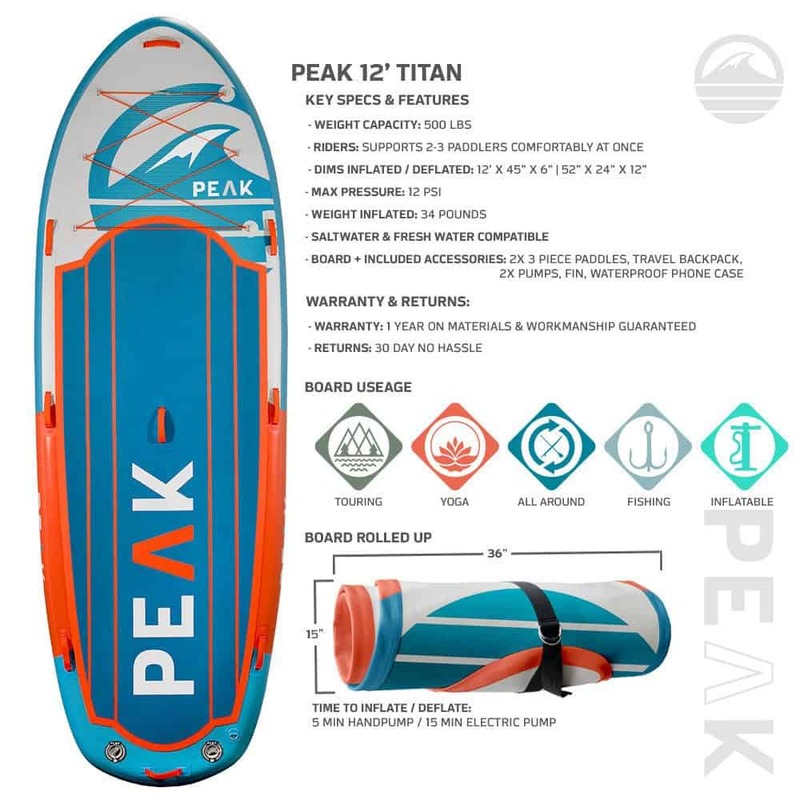 A great board for families, the 12-foot Titan Inflatable can carry a small group at once. However, despite its size and carrying capacity, the Titan is made with the Isle-construction system that makes the board 35 percent lighter than other SUPs in it class. The Titan has a large bungee-style storage system to handle all you gear. The Titan’s deck has a durable, ultra-soft traction pad, so it’s okay to load the kids and pets on as well. Like all Isle Surf’s inflatables, the Titan is built from ultra-strong military-grade PVC that is virtually impervious to casual wear. Royal blue in color, the Titan comes with color-matched accessories that includes two, three-piece floating paddles, two air pumps, one for each valve, five fins, a waterproof phone case and a duffel-bag style carry case. Accommodates up to five riders. Lightest weight of any paddleboard in its class. Soft deck pad for all-day paddling comfort. Three carry handles for easy transportation. Measures: 12’ x 45” x 6”. Maximum weight capacity of 500 pounds. Two air pumps for fast inflation. Does not come with a leash. Very difficult for one paddler to handle. Considering its size, the Titan is reported to be relatively easy to inflate in just about 15 minutes, with one person on each of the two pumps. Paddlers say the board is very stable, even when heavily loaded with people and gear. Since the Titan is meant for at least two people to paddle, it is too big for a solo paddler to handle practically. Paddlers are impressed with the Titan’s ability to handle larger loads and many paddlers feel it is the perfect SUP for a group overnight trip. We hope you enjoyed our Peak paddle board article. Please also check out our other Paddle Board Reviews for more great info. Be sure to leave any thoughts and comments below. 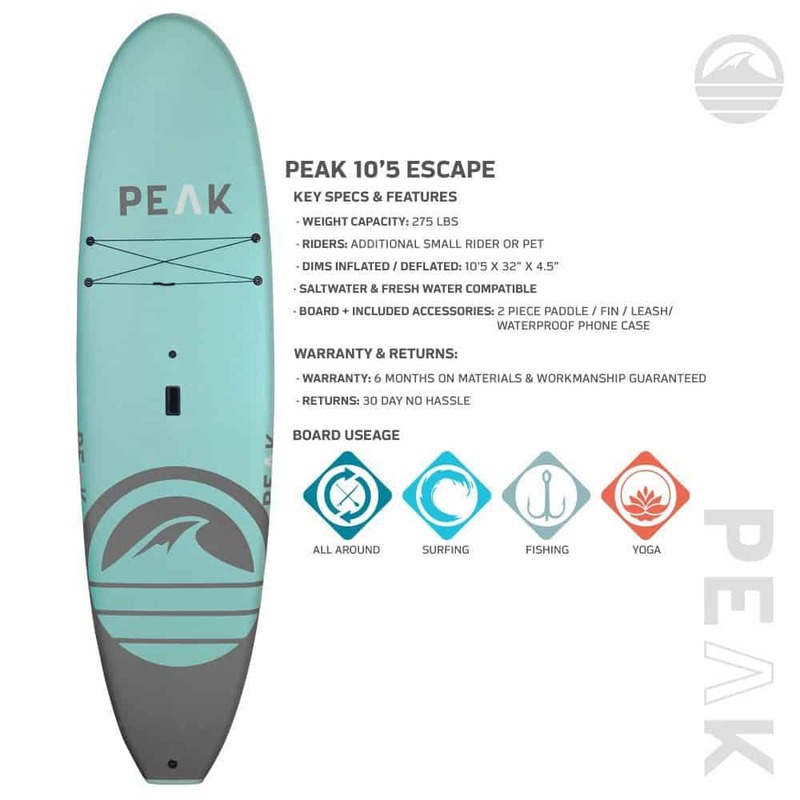 Isle Peak Paddle Board Review (SUP)	Overall rating:	5	out of 5 based on 5	reviews.